← What percentage of cats are black? I just took these photos. It shows the tabby coat as camouflage. I like to see the original tabby cat in nature. This hints at the wildcat ancestor. I like that. 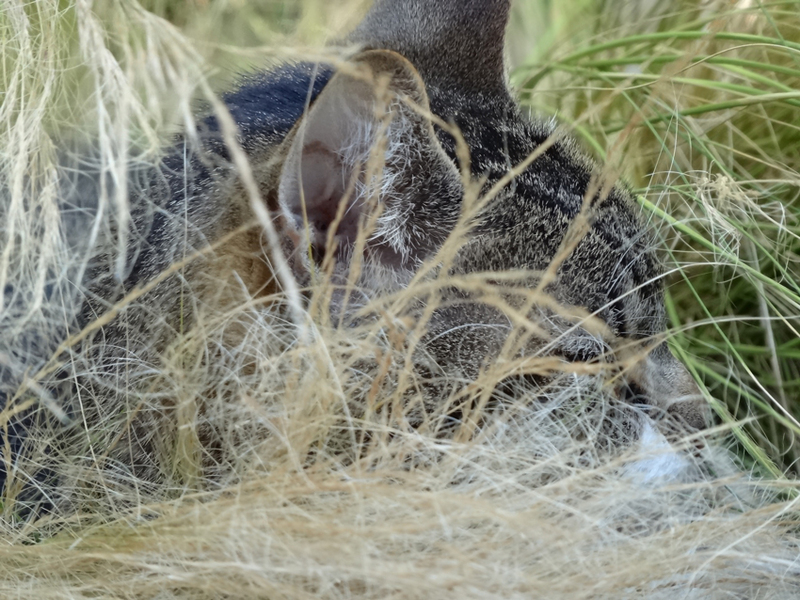 Long grass is probably one type of environment that the African/Asian wildcat – the domestic cat ancestor – has to hide in but there are others. I just like the feel of the photos. Cat coats tabby and tabby cat picture. This entry was posted in Cat Coats, Tabby coat and tagged tabby cat camouflage, tabby cat coats by Michael Broad. Bookmark the permalink. Wish that you could move her with you. Could you print some 11×14’s and then let me figure out how to do the page to offer them for adoption? The brindling and the grasses are just so much to absorb. My eyes get teary, just to see that beauty on a silly laptop screen. I want to have them on my wall, b&w or colour. Michael, she/he reminds me so much of my Oliver (Muckaluck’s mom). Michael she is wonderful – I would have to guess you are going to be very sad and concerned for her when you move to your new place. Maybe you can go back and visit her – she will have to get used to you not being there. One day she will come to your door and a totally different person will be there and I guess it will be a bit of a shock. I hope the new people are cat friendly. I hope they aren’t cat unfriendly because she will likely come and meow at them asking for you. Just at a guess. I suspect that’s what will happen. Camouflage and tabby cats it amazing. You really can’t see them. 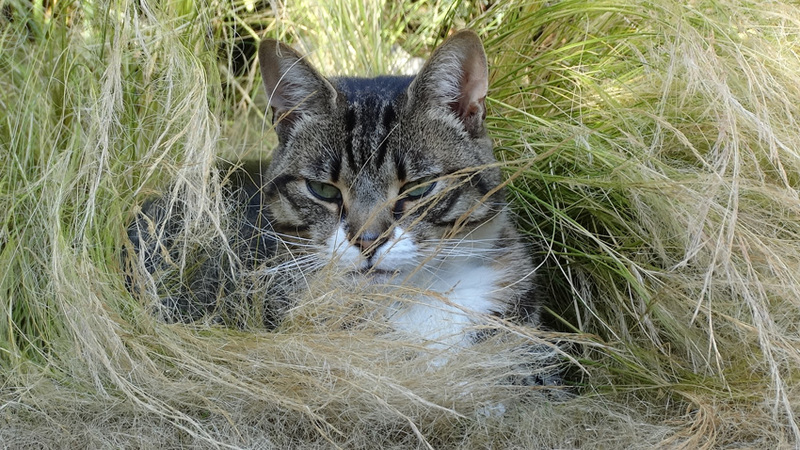 I’ve seen it many times with a tabby in the long grass or justin the nature and they just blend in so well it’s uncanny. They are lovely photos. Sorry to be so gloomy about her (she’s a girl right?) she’s such a beautiful cat and even on civil terms with Charlie – maybe she could go with you. I hope she has a nice life where she lives. Michael, has Ms. Kathrin touched one hair on any one of her Cats head? Neer, cept to study the nucleic acid! The UKZ ‘Tabby?’ WHY ashould we? She looks in very good condition Michael. I know what you mean about worrying about them all. I can’t pass a cat in any of the roads in my village without giving them the once over and I do fret about them. If only cats had the same status as dogs in our country. If only everyone understood what wonderful beings they are and took time to learn of their marvellous ways. William Blake could see it, even if not rhyme it very well lol! She is in good condition. She has a beautiful coat. I just feel that she is a little bit under the weather. It is not a big deal. I wonder what sort of illness she had or has. She might be a little down due to a recent sedation or anaesthetic, feeling a bit yuck due to a medication or a bit fed up from the visit to the vet. Gerry gets a little down, whenever he visits the vet, even if it’s just for a check up. He did spend six weeks living at the vet when he was dumped there (in a terrible state) and he has gone through a lot of treatment to get him fit and hearty again. So I just take extra care with him for a few days after and he seems to get back to his normal self a bit quicker. I hope this lovely tabby girl soon perks up. 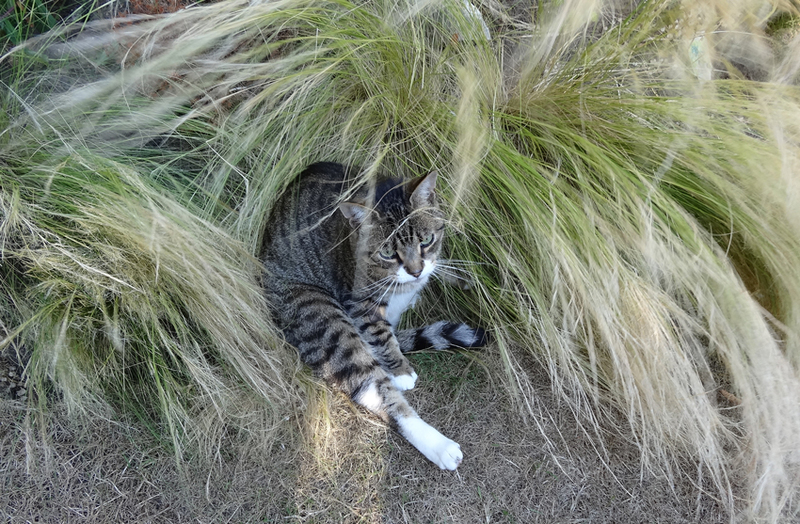 It looks like a wonderful hunting ground for her amidst the grasses. Very good point Jane. Or, as you say, she is on medication. She is still very loving and likes her tuna 😉 She has not come today. Her “owner” must wonder what happens to her as she stays around her for ages. She might be staying at home today, the weather here in the west is cold and wet. We have a visiting cat. He’s lovely, very well cared for, lives with four other cats, his owner is a gem, she adores her cats and is convinced that he would never have anything to do with any human who he hasn’t been introduced to in his own home. He’s fat as butter, has a collar and bell. I call him Tabby Tinkler. He visits twice a day most days. He’s been doing this for over two years. He’s great friends with my two. Comes in through the cat flap, plays with the boys, their toys and schlurps up any left over cat milk with relish. It took him up until about 4 months ago to allow himself to be touched. Now he lets me pick him up, fuss him etc. But his owner doesn’t know this! I don’t feed him, but as he wends his way on patrol around the home, he finds the two treat feeder balls and happily empties them. I don’t always pick them up in time. When TT stopped coming around for six weeks in the winter I was very worried. I needn’t have been. I think he and his fellow family felines must have been in a cattery whilst humans were off somewhere else. He turned up again one day, behaved normally, acted like he owned the place etc. I hope your girl turns up soon. I bet she’s at home, nice and snug. Lovely tabby cat 🙂 Is this the one that you feed? I love tabby patterns, they are all so beautiful. On my cat Thomas (dear old boy now departed) who was a black cat, in certain light you could see a tabby pattern in his coat, but with no white, he appeared to be a solid black cat but also a secret tabby! I love this cat, Jane and yes I do feed her. Ahhh..life is complicated. She must have been to the vet fairly recently because she has fur shaved from her right foreleg and there is a small scab under her chin. She seems a little bit depressed but adorable. She is OK but…Oh..I worry about them all. Maybe Thomas was a melanistic tabby. A mutated tabby cat. What you describe is melanism. Oooh melanism! I never knew that. I must read through the article in the link. I remember about the Agouti gene and it’s absence being the only thing between tabby and non tabby, but I may have remembered that incorrectly, which given the state of my brain these days is the most likely thing. Thomas was born to a Muzz, a short haired brown tabby tuxedo female of a small feral colony that lived in the garden when I moved in here. Before I could trap her (the toms were easy) she gave birth to four kittens, all from different Dads I think. I kept all of the kittens. Included in the litter were Thomas – all black, Patti – long haired brown tabby, Angel – short haired blue with some tabby striping and Leo – long haired blue with tuxedo markings. Thomas’s Dad belonged to an old bloke down the road who refused to get his big old battle scarred tom neutered. This sounds like melanism, which is a genetic mutation. A lot of wild cats have it but it is rare. The black panther is usually a melanistic jaguar (living in South America). You can see the ghost rosette spots of the melanistic jaguar. Beautiful foliage and cat, Mr. Michael. Thanks dw. Hope you are well and your family.